An aggressive aerial assault helped firefighters on the ground corral a small wildfire about 40 miles southeast of Fairbanks and 6 miles northeast of Harding Lake on Wednesday evening. 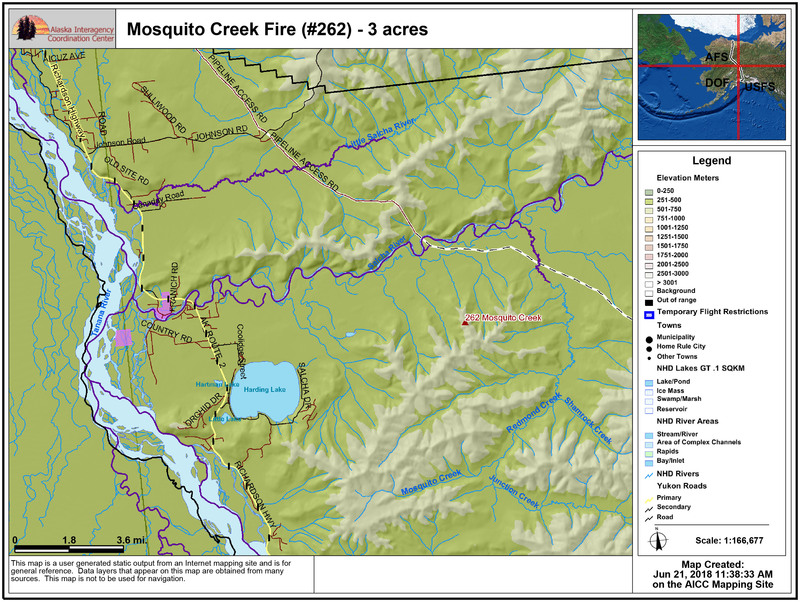 A map showing the location of the Mosquito Creek Fire (#262) approximately 6 miles northeast of Harding Lake. An Alaska Division of Forestry engine crew patrolling near Harding Lake reported the Mosquito Creek Fire (#262) at 6 p.m. after spotting smoke in the area. A helicopter from the Fairbanks Area Forestry office responded and found a 1 acre fire burning on a ridgetop in a mix of hardwoods and spruce with a 100 percent active perimeter. A load of eight smokejumpers from the BLM Alaska Fire Service was ordered to the fire, as was air attack, an air tanker and four water-scooping aircraft from the Alaska Interagency Coordination Center at Fort Wainwright in Fairbanks. The helicopter on scene made multiple water drops on the fire prior to the arrival of other aircraft. Once on scene, the water scoopers knocked the fire down and the air tanker dropped retardant to box the fire in while eight smokejumpers deployed and hiked up to the fire. The fire’s close proximity to Harding Lake made for quick turnaround times for the water scoopers, allowing them to keep the fire knocked down until smokejumpers arrived. The smokejumpers reported the fire at 3 acres and described the fire behavior as smoldering and creeping with a low potential for spread. Smokejumpers began constructing a saw line around the fire to keep it confined. At 9 a.m. on Thursday, smokejumpers reported the saw line had held overnight and they began dry mopping the fire because of minimal water sources near the fire. Smokejumpers were also constructing a helicopter landing spot closer to the fire. Smokejumpers reported finding a tree that had previously been struck by lightning, leading fire managers to believe the fire was started by a lightning activity last week.